I looked for this book after reading about it in J. Kingston Pierce's "The Book You Have To Read" column over at the Rap Sheet. It was not available in fine condition at the time, at least in my price range, so I passed on it then and went on to something else. This last week, I obtained a fine hardcover in the Best Mysteries of All Time edition for less than $20, and good gosh, I'm delighted to have it. It is indeed a book to treasure. It seems to me that it stands to the detective novel as The Spy Who Came In From The Cold stands to the spy novel. It turns its heel on some genre cliches, yet it rings truer and deeper to what the genre is fundamentally about. You can read J. Kingston Pierce's essay on The Eighth Circle at this link. Lawrence Block praises the author and tells some funny stories about him at this link. 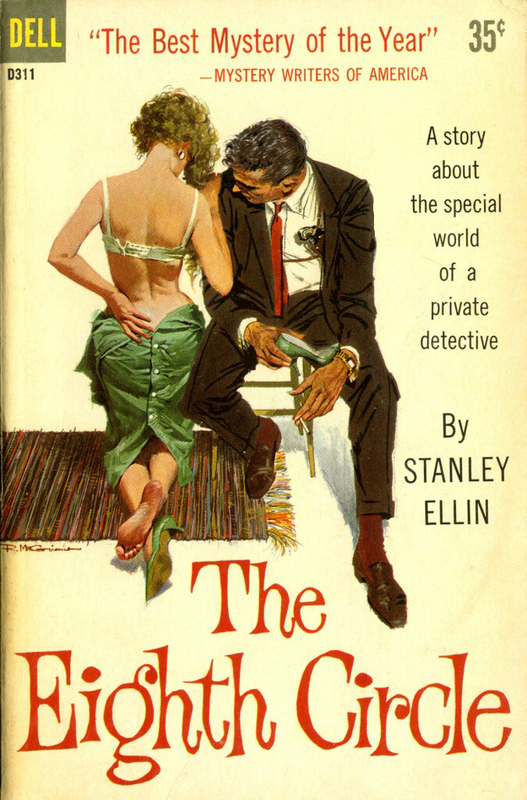 There's a nice piece on Stanley Ellin over at the Tipping My Fedora blog, here. 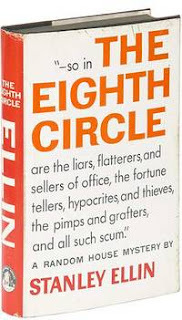 The epigraph of the novel is from The Inferno: "...so in the eighth circle are the liars, flatterers, and sellers of office, the fortune tellers, hypocrites, and thieves, the pimps and grafters, and all such scum." And why is The Maltese Falcon included in the picture above? Well, if you recall the irony, Sam Spade has something to do with his partner's wife, yet after his partner is killed, Spade is determined to track down the killer. Perhaps Stanley Ellin did not intend for such a connection to be made, but perhaps he did. Inspired or crafted, either way the novel is magnificent. 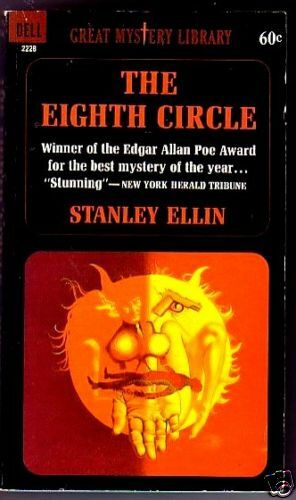 I like the Robert McGinnis art work enough to take the time to scan it full size on my own dustjacket for my personal hardcover copy of The Eighth Circle, now in a clear and protective Brodart cover.